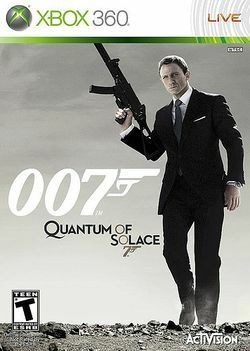 For the Nintendo DS version, see James Bond 007: Quantum of Solace (Nintendo DS). James Bond now goes into action in this much darker game starring Daniel Craig. With the likeness of the celebrities and voicing their roles, you'll enjoy the addition of sequences from Casino Royale to compliment the length of the game. You'll now go back to shooting in first person shooter since Nightfire but has the addition of third person cover and unarmed sequences which you need to get ready for. This game takes place in both Casino Royale and Quantum of Solace. This page was last edited on 30 May 2016, at 14:12.